18/03 RVX’s Star of the Show! RVX’s Star of the Show! Last week, at the RVX inaugural show in Salt Lake City Utah, many RV Dealers commented Bitimec’s ‘Wash Bots’ RV Washing Machine was; “the neatest new product at the show”! With the RV season just around the corner for some, and in full-swing for others, RV Dealers are feverishly scouring the market for operational efficiency fixes. 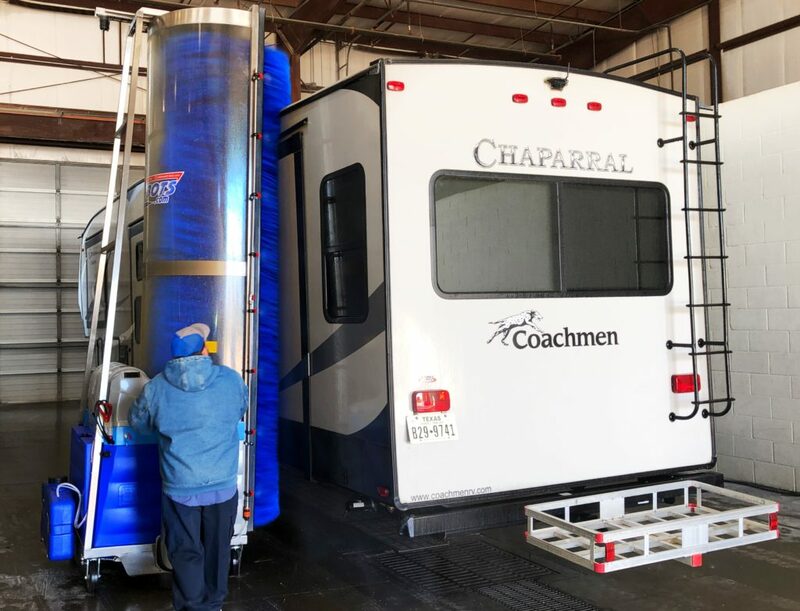 Over forty percent of Dealers have identified ‘RV washing and detailing’ as one of the critically inefficient areas plagued by bottlenecks mostly due to high turnover, no-shows and chronically low productivity. Today a good detailer pocketing $13.00/hour costs a company around $20.00 an hour including taxes, benefits and worker’s comp! And even at HIGHER salaries, few end up staying-on. So, making the detailer’s job less tedious and improving productivity is a goal many dealers are striving for. 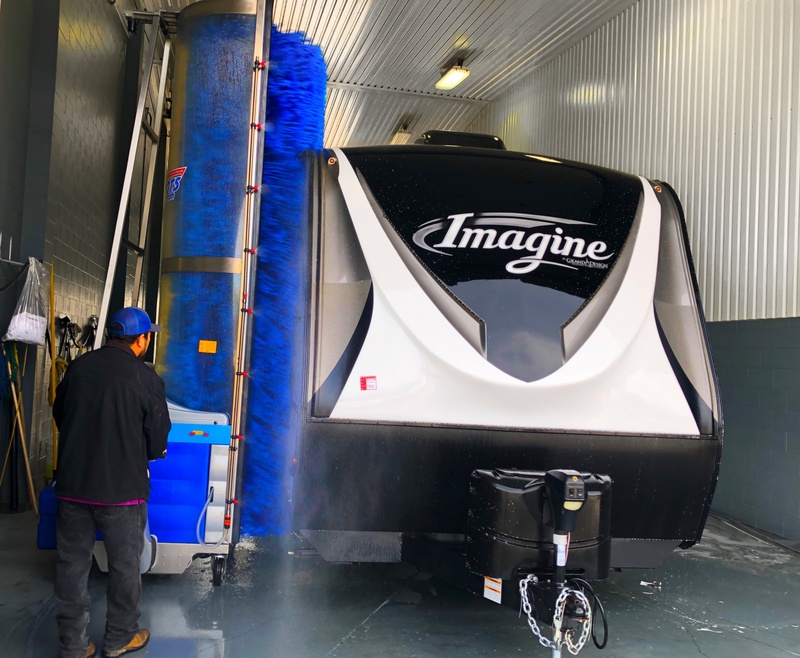 At about $16.00/day (over its 10-year life estimating 260 work days per year), Bitimec is the most cost-effective RV washing solution on the market today. The state-of-the art battery powered 626-EZ Wash Bot demo at Bitimec’s RVX booth, WOWED everyone who saw the vivid illustration of the ease of use, and how fast and evenly a Wash-Bot engages the whole section of the vehicles being washed. Detailers with brooms, typically wash about 50 square feet per minute with two strokes. The 12’6” tall Bitimec brush on a Bitimec Wash Bot, spinning at about 100rpm, washes at about 250 square feet per minute, with the equivalent of 10 brush strokes (in two passes). Providing a better, more even coverage for fast results. NIRVC- Dallas, TX and Lawrenceville, GA and Phoenix AZ Since 2013. 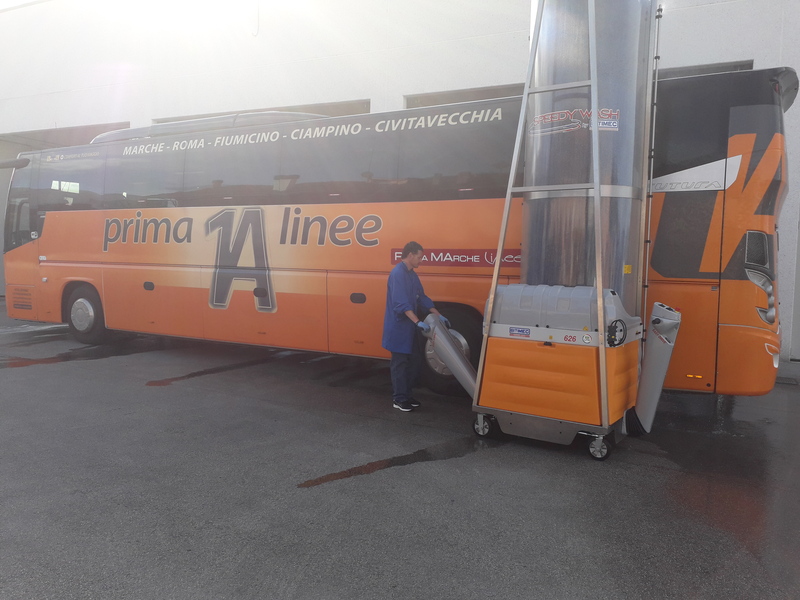 “The Bitimec Wash Bot has increased our productivity, and has enabled us to provide a more consistent experience for our customers. We wouldn’t go back to using a brush and a stick to clean that much real estate.” – Mike Griggs Detail Director (for the 3 NIRVC locations). 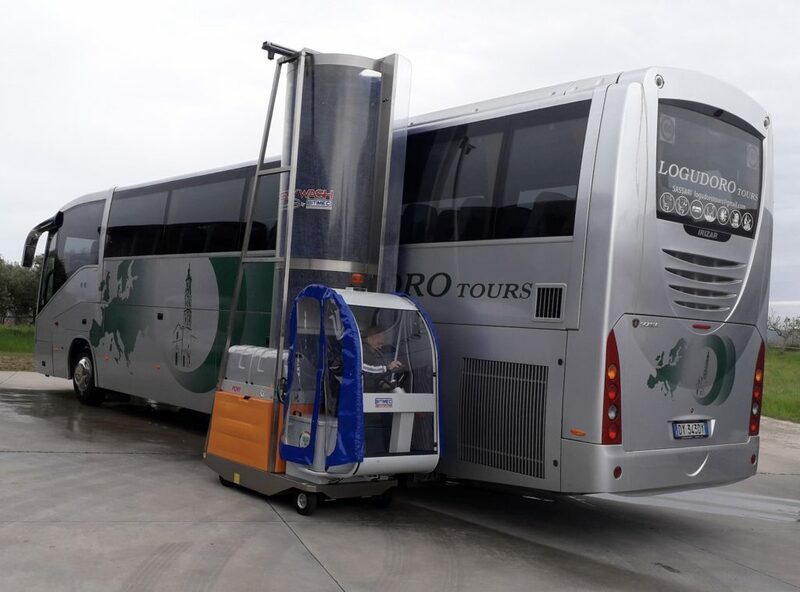 Bitimec Wash Bots is advancing customers a ‘sneak-preview’ at the NEW Lithium Ion Battery line of bus, RV and truck washing machines. The line distinguishes itself by the ‘OJ’ colored water tank and works as well as ever. The Li batteries allow the unit to recharge extremely fast, even in the small space between washes or during a coffee break, with batteries that recharge super-fast, and are do not ‘age’ with frequent recharging. So even if the night crew ‘forgot’ to leave the unit on charge, the day crew can still wash its full quota of vehicles. The Li line includes the best-selling Model 626 in the new ‘Li’ version, seen here engulfed in fog, but ‘picture perfect’, looking as sharp as ever on a matching color bus. And the Pony Li, seen here affording the operator the comfort of a seat and cab, quietly washing as fast as a 4-man strong wash crew. 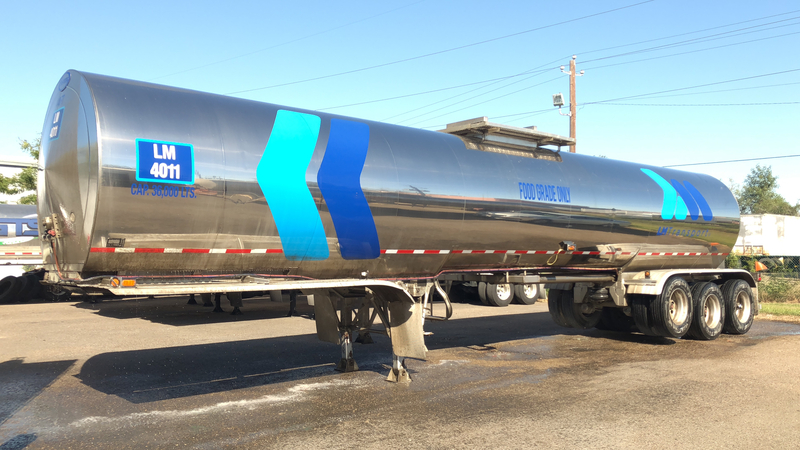 Bitimec Wash Bots has recently delivered its first ‘Series 3’ battery powered tanker-truck washing-machine in the United States, to Frontera Truck Wash of McAllen TEXAS. 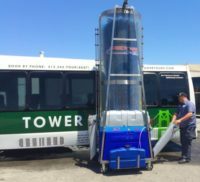 The unit was sold by WET (Washing Equipment of Texas Ltd) and delivered by Victor de los Santos of WET and Chris Nystrom of Bitimec Wash-Bots USA. 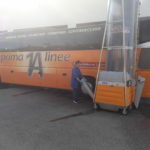 Bitimec’s ‘single-brush’ bus washers are winning-over Airport Shuttle operators as the ‘must-have’ machines for maintaining clean shuttle buses. 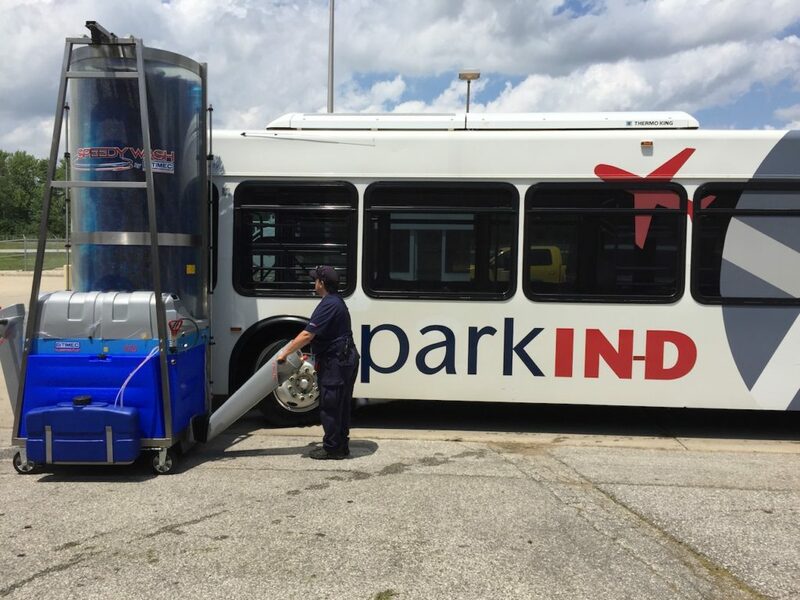 Designed for washing large vehicles affordably, the units are high-tech power brushes on wheels able to soap, brush-wash, and rinse a typical airport shuttle bus in 6 minutes. 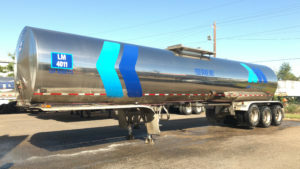 Indiana Beverage choose Bitimec Wash-Bots Truck Wash Equipment for 2 of their most premier locations. With roots tracing back to the 1930’s, Indiana Beverage is a family-owned beer wholesaler. Indiana Beverage distributes over 550 brands of beer to retail partners, such as liquor stores, grocery stores, restaurants, hotels, taverns and other retail outlets throughout Northern Indiana. The new model, called the Tank 626 EZ, is an all stainless steel Tank washing machine. Thus, assuring a corrosion free, long structural life (even the powder coated battery skirt and covers are stainless). Four 6Volt High Capacity (320Ah) batteries are connected in series supply to supply 24Volts current. Therefore, making it possible to wash about 30 vehicles on a single charge.